The Instant Pot Max is scheduled to be released on the market by the end of January. You might recognize this brand for its astonishing multi-functional cookers. The pressure threshold of this newest model is much more than the threshold of other products made by the company. 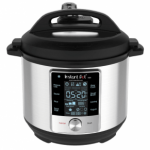 The Instant Pot Max also has an automatic steam release feature and better canning functions. Most notably, there is a new technology introduced into the unit called NutriBoost. This technology is designed to move around the food inside the cooking pot so that the motion matches the movement of the boiling water. 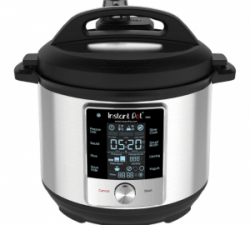 The only downside is that it costs more than most other Instant Pot products. 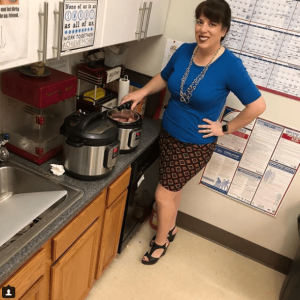 To see the how the Instant Pot Max compares to other similar products on the market, continue reading below. The previous Instant Pot model had a huge digital screen that looked nice, but it was not a touch screen. The Instant Pot Max has both a nice big screen and a touchscreen ability. You’ll find the most important cooking options are available with the Max, such as Pressure Cook, Yogurt, Canning, Soup, Slow Cook, Rice, Sauté, and Sous Vide. Also, the display screen will provide you with up-to-date information about the unit, such as the pot’s internal temperature. Along the top of the screen, there is a progress bar which lets you know how close the food is to being done. When you need to vent the food, whether it’s a whole fast release or an intermittent release, you can initiate this function with the touch screen too. The days of manual venting are over. The Instant Pot Max lets you program your venting and pressure cooking before activating the cooker. Once the cooking time has expired, the venting will automatically begin. This means you don’t need to wait around and watch it anymore. A convenient update which allows you to easily store the cooker because the cord is no longer permanently attached. Now you’ll have more room for storage. This is a new feature which stirs your food for you in the pot. It tries to move the food around quickly to match the movements of the boiling water in the pot. This is supposed to help cook the food better, especially if you’re preparing broth, rice, or dried beans. If you want to do canning in small batches, then you’ll love this feature of the Instant Pot Max. Just be sure to use recipes which are meant for pressure canning. Don’t do more than four jars (16 oz. each) at one time. The NutriBoost feature and the internal thermometer of the Instant Pot Max allows it to be sous vide machine. You will love the slow cooker feature of this pot because it seems better than it does in the other models that came before it. The digital sound alerts used to make sounds in previous models. The Instant Pot Max lets you mute these sound alerts. That way, you can quietly cook your food without disturbing anyone around you. When trying various recipes in the Instant Pot Max, they came out better than they did in the Instant Pot Duo. The pot heated quicker with the updated heating elements inside it, both for the pressure cooker and sauté modes. Plus, the Max is more attractive with lots of updated features, and it can be cleaned easily. With that being said, there are some issues with it that you might want to consider. The Instant Pot Duo let you begin cooking immediately since there was no LCD screen. You just had buttons on display that you pushed to make things happen. As for the Instant Pot Max, you need to learn how to control the venting properly or else the food will get overcooked. This requires you to read the instructions beforehand. There is a valve inside the lid which you can remove to clean. You might be annoyed with these kinds of small parts that you need to take off and clean. I’ve waited a long time for a pressure cooker such as this one. It includes all the safety features, as well as being simple to use and clean. I did quite a bit of research and gathered many reviews of several electric pressure cookers. I picked on the Max for two principal features – stainless inner pot and 15 PSI for canning function. I studied the manual and obeyed the instructions for the initial water test which I was able to do in approximately 15 minutes. The touchscreen makes the Max remarkably easy to operate. 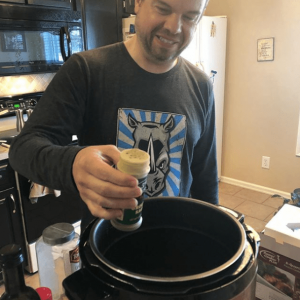 I have only had my Instant Pot Max for seven days and have already used it every day. All the food that I have prepared in it has turned out flawlessly. Save your money. Worse than the Ultra model. This Instant Pot was certainly rushed to market too quickly. It takes longer to heat up than the Ultra model. The manual notes to modes that aren’t available. Very frustrated the top Instant Pot with most safety features does not have WiFi. Not good enough sadly. Hope next Version has WiFi and USDA approved canning. 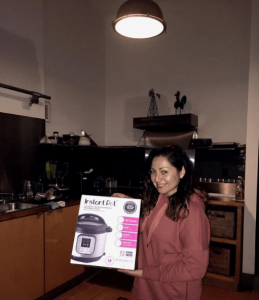 I paid a little more for the Max model because controls were thought to be easier and more intuitive than the other Instant Pot models. My spouse, the family chef, loves it. He states it is simple to use. He uses the pressure cooking setting frequently. He was able to make delicious pulled pork sliders in just under 90 minutes when it usually takes all day in the crockpot.